Mad Hatters Teapot: Oh My God! Gene “Effing” Simmons was at the Pittsburgh Home & Garden Show! Oh My God! Gene “Effing” Simmons was at the Pittsburgh Home & Garden Show! Who would have thought that we’d see the long tongued icon of Rock-N-Roll at this mundane event! Has he moved to the ‘Burgh? Is he ready for a new kitchen? Is he interested in staying in touch with his friends and family? Well, when he stopped by the Case Remodeling/SendOutCards booth (2614), he drew quite a crowd! Most just starred in AWE, but I just had to get my photo taken with The Demon of Kiss or no one would believe that I met Gene Simmons! Pretty cool! OK, You busted me. 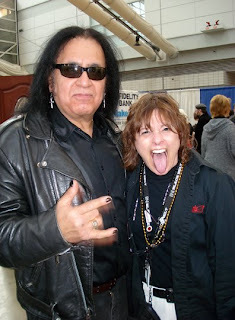 That’s not the real Gene Simmons, but look-a-like, Pete Galvan. I bet he could fool even, Shannon! OK, maybe not Shannon, but everyone else! If you aren’t connected enough to add him to your guest list or don’t have the budget for the real Gene Simmons; you can add a little color and life to your next event or party with the next best thing! I wanna rock and roll all nite and party every day! Love the pic, Rosemary, even if he's not the real thing!